OEM Brackets Direct understands that our customers are looking for the best value; value encompassing superior products for less. And because we make serving our customers a priority, we provide that value. All of our flat screen wall mount brackets are made in the same factory as the brand name flat panel brackets, but because our brackets don't come with a brand name, we can offer them for much less. Each TV bracket model on OEMBracketsDirect.com offers a different TV mounting feature. For example flush mount provides the most streamline look, so if you are concerned about your TV's profile, a flush mount is the way to go. Meanwhile, some models offer "the works" in terms of adjustment and versatility from tilt features that help stop glare to rotating arms for different viewing angles. 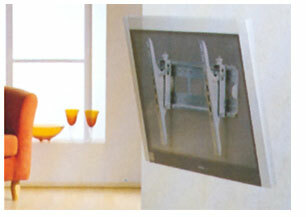 - The flush mount style of these TV brackets offers a secure, low-profile fit. - The tilt range of these TV brackets offers viewing versatility, allowing the user to tilt the TV down 15 degrees. This tilt feature helps prevent glare, and offers wider viewing range options. - The wider tilt range of these TV brackets offers even further viewing versatility, allowing the user to tilt the TV both down and up 15 degrees. This tilt feature helps prevent glare, and offers wider viewing range options. 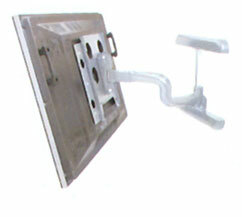 - These articulating TV brackets offers up to 180 degree side to side rotation with a tilt feature. The 180 degree rotation helps the user control the viewing angle significantly. Adding to this rotation is an up and down 15 degree tilt (to assist with preventing glare). 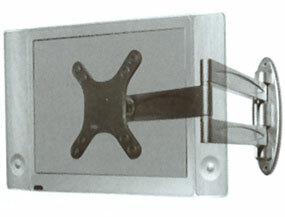 - This pan and tilt TV bracket offers up to 80 degree side to side rotation with a tilt feature. The 80 degree rotation helps the user expand the viewing angle when compared to flush mounts. Adding to this rotation is a tilt down feature of up to 15 degrees. Because our LCD panel wall mount brackets are made in the same factory as the brand labels, our flat screen TV brackets offer the same, and even superior, quality as the well-known names. Our TV brackets are made from A3 Steel, which is rated by ASTM International (originally the American Society for Testing and Materials) for steel rails in mines and railroad tracks. Obviously, this industrial grade steel, which is rated to handle the rigors of railroads and mines, can easily handle securing any flat panel screen TV to the wall. ASTM International is the largest voluntary standards development organization in the world, started in 1898. This organization rates products on the basis of quality and relevancy, and is a trusted source for measuring products and services with a rigorous standardized system that focuses on safety and cost efficiency. Aside from using industrial grade A3 Steel, we further ensure the highest quality by powder coating all of our LCD TV brackets. Powder coating consists of applying a powder pigment to a surface and heating it. The heating of the pigments causes them to chemically bond to each other and to the surface to which they have been applied. Because the chemical bond occurs at the atomic level, it is a very strong bond that can withstand a lot of wear and tear. Powder coating is preferred for certain surfaces because it creates or contains close to no volatile organic compounds and does not sag or run with thicker coats, and it is also more versatile than traditional liquid paints. Finally, the powder coated finish prevents corrosion of the steel by providing a protective layer against moisture and other impurities. Finally, we know that customers want the most versatile product available; the more applications a product has, the higher its value. As a result, all of our flat screen brackets are universal, meaning they are suitable for any brand of flat screen TV, except for those noted in the individual descriptions. We are so sure of our product, we even offer a Fit Guarantee as our promise to our customers.